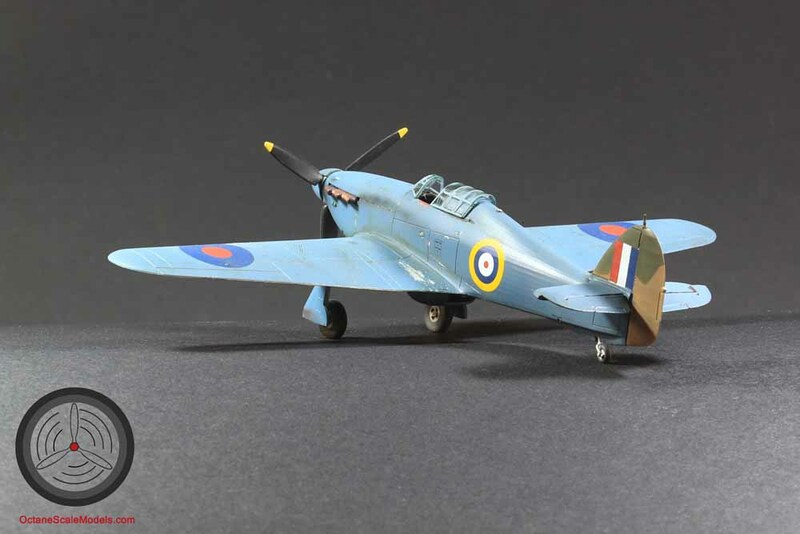 Arma Hobby Model Kits 1:72 Hurricane Mk.I, built as V7101 Hurricane PR.I of 69 Sqn Royal Air Force based from RAF Luqa, Malta, 1941. V7101 was built by Gloster as a standard Hurricane Mk.I and was the 423rd aircraft of 1700 ordered as part of the 3rd Gloster production order 85730/40/23a; it was delivered around about September 1940. 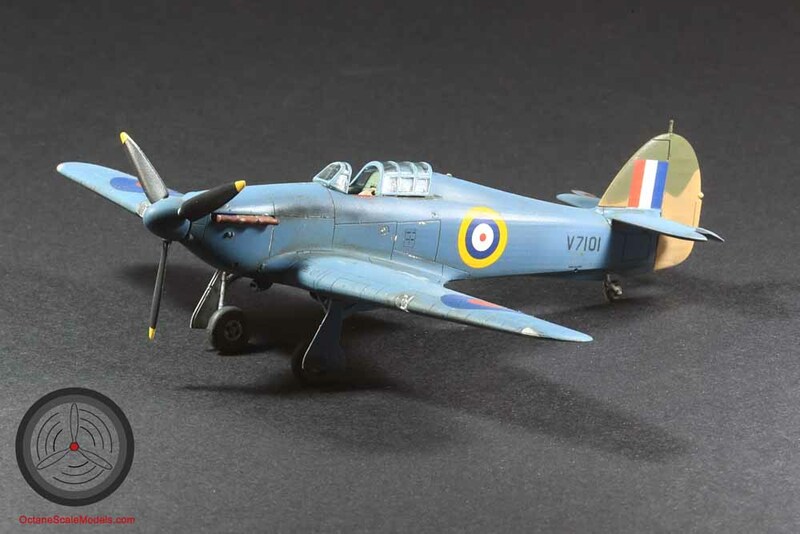 The 1st squadron on record as having V7101 listed is 261 Sqn which was formed on 2nd August 1940 from the amalgamation of the Malta Fighter Flight (including the famous Gladiators Faith and Hope – Charity having been shot down the week previously) and 418 Flight operating Hurricane Mk.I. 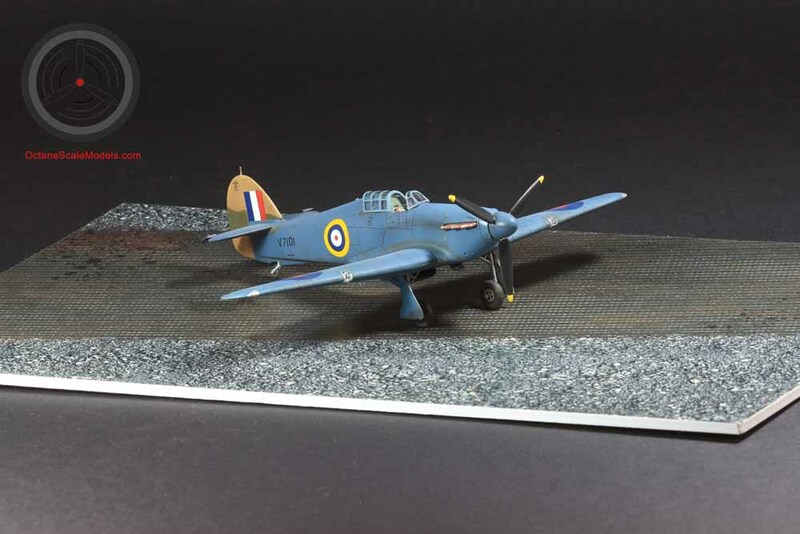 The Squadron was badly mauled by German and Italian bombers and fighters and when 185 Sqn arrived to relieve them in May 1941 the Squadron was disbanded. Just prior to the disbandment of 261 Sqn, V7101 was transferred to 69 Sqn (a mostly Martin Maryland equipped recon unit) and was locally converted to a reconnaissance role. If this was due to damage is unknown but the one photo I have come across of the aircraft shows it supposedly during its conversion to a Photo recon aircraft and it can be seen painted in it the local equivalent of PR Blue with an A-Pattern Camouflaged tail fitted. 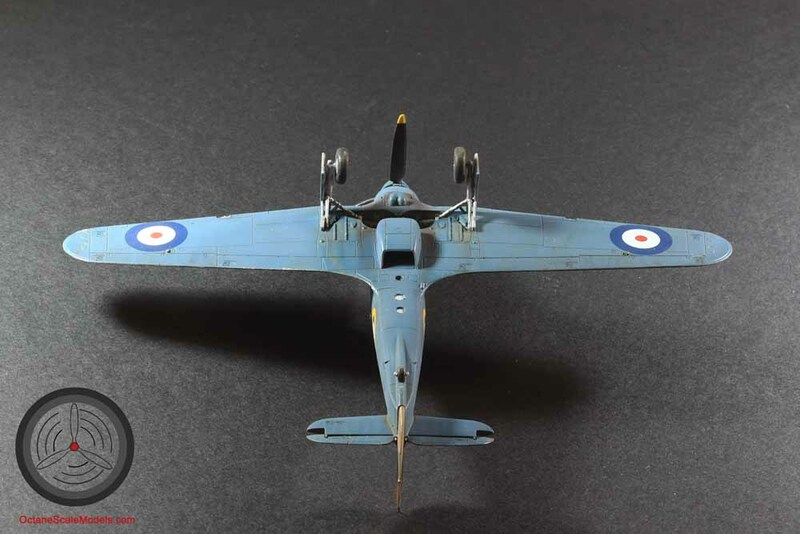 Other than the paint job, the conversion consisted of striping out whatever weight was possible – so guns, armour, radios etc were all removed, and 2 vertical cameras added behind the cockpit. This aircraft did not have the belly pack seen fitted to most PR Hurricanes in the Western desert, and if it had the Volkes filter fitted whist flying with 261 Sqn this was also removed to improved performance, at this stage if the aircraft had been previously fitted with a deHaviland 3 blade prop this was changed to a Rotol unit to improve climb rate. After September 1941, V7101 appears on the muster of 151 OTU (Operational Training Unit) in Risalpur in India from 28 July 1942. It was struck off charge on 1st March 1944 and likely broken for scrap and raw materials. When Arma announced the availability of their new Hurricane I ordered a couple and 3 sets of overtrees. This was built from one of the overtree sets – so no PE was included in the build. 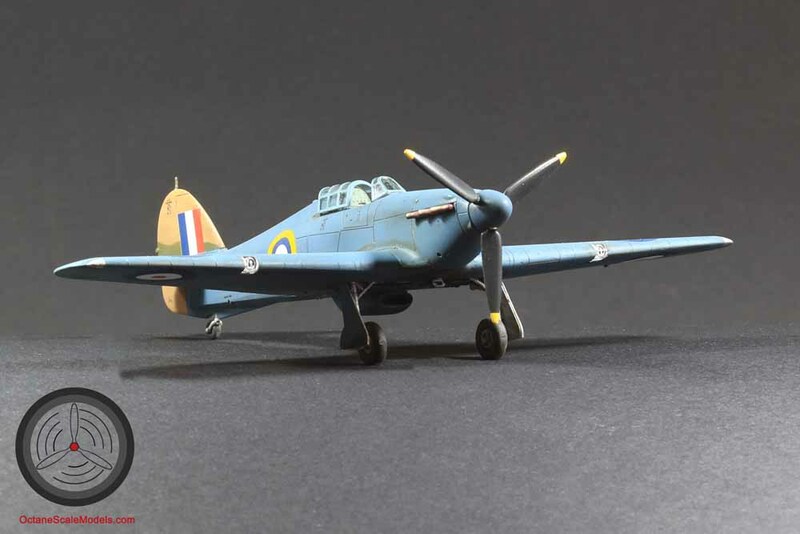 There is a LOT of detail in the standard kit cockpit and care has to be taken to align everything up to ensure a fit between the wings without hassle; when this is done the fit is extremely good – in fact if you initially prime on the sprue then you may have fit issues as the tolerances are that fine! I’m happy to say there were no fit issues other than those caused by me. 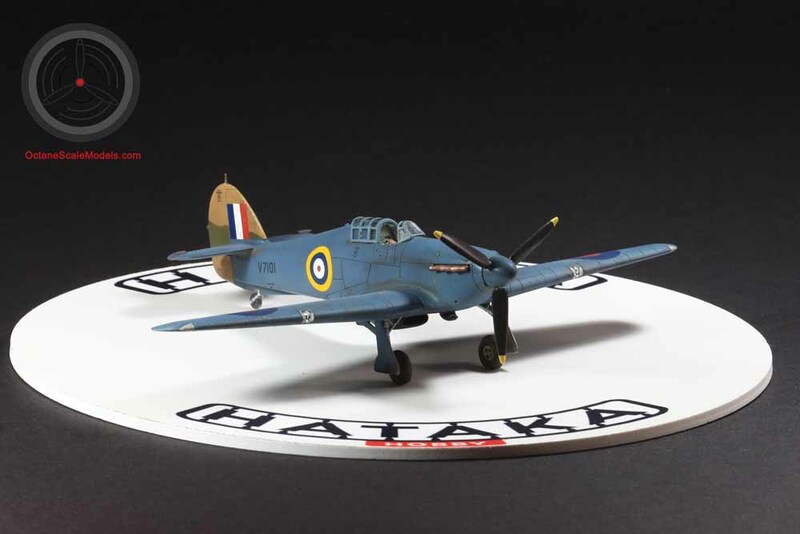 I started by painting the aircraft in its original finish colours of Aluminium and Red Dope using Hataka Orange Line lacquer paint and then built up the top coats with their Red Line acrylic PRU Blue (the WWII shade not the later BS641C one as this is a little bit darker and I think closer matches the local mix used in Malta). This process allowed me to chip and buff through to the softer acrylic paint to the rock hard lacquer layer below. My airbrush is an Iwata HP-C+ (0.3mm). Staining came from Flory washes and a mixed grey and sand to give slightly dusty feel, the usual Merlin oil stains are from pastels applied with a cotton bud, exhaust stains are a black wash (rather than a solid colour) sprayed through an Iwata HP-B+ (0.2mm). The decals are actually all from the Arma sheet with a suitable rearranged serial number, these are printed by Tech-Mod and applied well and responded well to the usual Micro Set and Micro Sol. The 2 bases are my usual supplier, Coastal Kits Display Bases of Blackpool, UK. 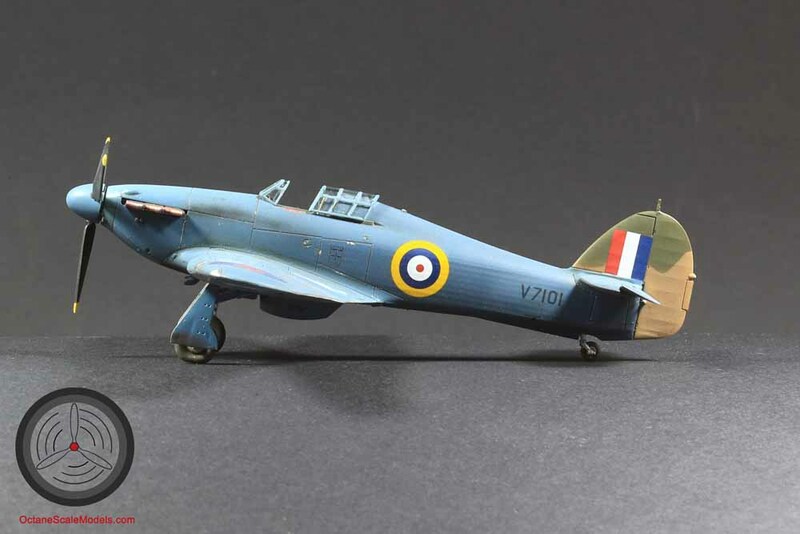 08/02/2019 Wojtek BułhakBlog, Model GalleryNo Comment	1:72, built model, Hurricane.